Dave and I decided to take Caiden to Ihop for dinner for his birthday. He loves their pankcakes, and we thought it would be a fun treat. We arrived and Ihop was all decked out for the movie "Horton Hears a Who" which we were going to take Caiden to the next day. 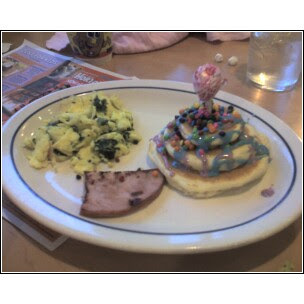 Caiden ordered from the Horton menu in that he had the Dr. Seuss special of green eggs (spinach mixed in with scrambled eggs) and ham and Horton hears a who pancakes with strawberry and bosenberry topping equipped with a flower (lollipop) in which Horton hears the Who from the speck on the clover. Interestingly enough, the place was packed with people, but of a somewhat older crowd. After the waitresses came out singing for Caiden, the other patrons asked Dave and I to come over with Kiya and Caiden. 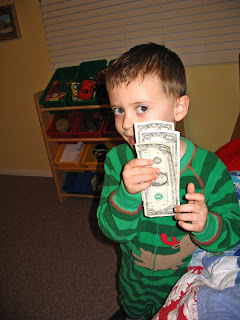 They said their "oohhs"and "awws" over Kiya and then unexpectedly each table started handing Caiden birthday money. It was soo nice of them, but I felt a bit uncomfortable like the restaurant was looking at us making the rounds like the collection plate at church or something. Dave said that it was ok since THEY called us over there, and it wasn't like we were asking for money. Still it was VERY nice of them. Caiden was really grateful too. We want Cake! We want cake! I love spinach! I want some of those green eggs! Now that I look at that dinner closer (not on a cell phone camera)it looks a little scary...hehehe. I am broke, do you think if I go to IHOP and say it is my birthday, people will give me money?? hehehe!! Caiden sounds like he celebrates his birthday like me...over SEVERAL days!! It is the only way to do it!! I loved the song! And I especially loved it when he called to sing Happy Birthday to me!